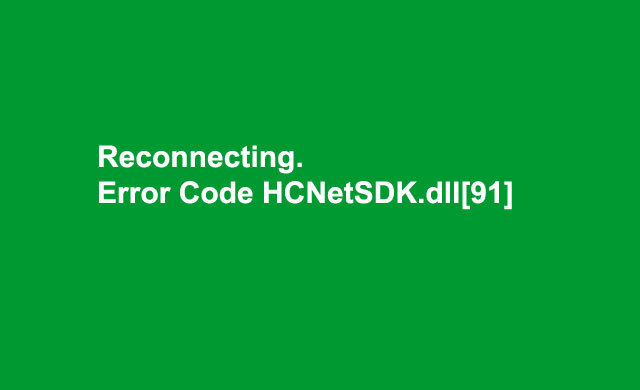 Reconnecting.Error Code HCNetSDK.dll – Hikvision Camera Video Loss Problem Solved! Home / Troubleshooting / Reconnecting.Error Code HCNetSDK.dll – Hikvision Camera Video Loss Problem Solved! We have 8 Channel NVR DS-7608NI-SE with 7 cameras HikVision DS-2CD2020F-I and 1 Hikvision DS-2CD2120F-1 outdoor camera. One of DS-2CD2020F-I camera is not displaying the video most of the time. However, if we connect directly to the camera’s IP, not via NVR it shows the video perfectly, however using this mode I cannot record the video to the hard drive that located inside the NVR. Our conclusion at this stage is the problem is not software related. There are two possibilities, Camera problem or NVR problem. We contact our CCTV supplier and they bring the new camera after replacing with the new camera we still have the problem. After several tests, we found that the problem was not enough power to the camera sent by the adaptor. All cameras we bought using passive POE adaptor as below picture. With passive POE adaptor, the max distance is about 40 meters (130 feet). This kind of POE adaptor is not 802.3af standard, this is actually for a device that not POE capable. As a passive device, the longer the UTP cable the more drop power to the camera. The installation of passive POE injector is not as simple as POE standard, near camera requires passive POE splitter to divide between the power cable and data cable. From POE passive splitter to other POE passive splitter using UTP cat 5. Remember maximum cable length is 40 meters or 130 feet. More than 40mtrs you are going to have video loss problem as our experience above. Finally, we are using POE Injector TL-POE150S, this device comply with IEEE 802.3af protocol. This POE injector will automatically adjust the power required by the camera (or other POE enable device). Support Gigabit speed and no other configuration required, just plug and play device. We are using UTP cat 5 from camera DS-2CD2020F-I to the POE TL-POE150s the distance is about 80 meters. We placed the POE inside the switch cabinet where the electrical outlet available. We never experience video loss again since then. Video loss problem on IP camera can be caused by power shortage to the camera. If your camera is POE capable device we suggest you use active POE (standard POE) for better power supply and can be used up to 100 meters. If your device is not POE enable and less than 40 meters, you can use passive POE to power up the device properly. If your device is not POE enable and use UTP cable up to 100 meters you still can use active POE with an additional device. TP-link have a product called TL-POE10R, combined with TL-POE150S it can be the answer to your need.